This unique blend contains natural enzymes and deodorizers that actually eliminate odors rather than just cover them up. Spray your dog, the cat, and their beds, litter pan, or where they spray and wherever you find the need for a breath of fresh air. You'll find yourself wanting some at home, in the car or wherever odors seem to pop up. Eliminate bad odors quickly by spraying area directly or for a skunked dog mix 2 cups into a Gallonlon of water to use as a rinse before and after bathing with Nature's Specialties Smelly Pet Shampoo which contains the same natural enzymes and deodorizers. 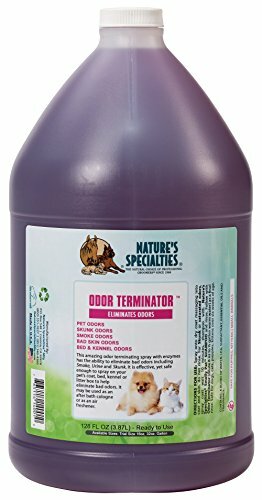 Safe to use on dogs,cats,kittens,puppies,pets. Ready to use.